Politicians love to hand out money to businesses, don’t they? These business subsidies allow elected officials to put out nice press releases saying they are creating jobs. They may get to cut some ribbons with big oversize scissors. This money comes from you, the taxpayer, but few politicians share the credit. It’s clear that subsidy programs are a good deal for politicians. But do these cash handouts to business owners actually help the economy? Probably not. Created in 2007, the QACF allows the state to provide cash grants to select entities in the hopes of attracting and retaining businesses within Arkansas. These subsidies are awarded to businesses primarily at the discretion of the governor. The $176 million QACF has been used to subsidize more than 75 projects, including $10 million to Hewlett-Packard in Conway, nearly $7 million to LM Wind Power in Little Rock, almost $3 million to Caterpillar in North Little Rock, and more than $2 million to Neckbone Productions for the filming of the movie “Mud”. Bundrick and Snyder find that QACF subsidies provided to businesses within a given county have no statistically meaningful relationship with private employment per 1,000 population and private establishments per 1,000 population over a four-year period after the subsidies are disbursed. The researchers also find no evidence to suggest that a given county experiences any meaningful employment or establishment spillover effects related to QACF subsidies awarded to businesses in neighboring counties. Bundrick and Snyder conclude that the evidence provides reason to be skeptical of the QACF as a job creator. If Arkansas’s politicians are aiming to develop policy that will positively affect job creation in Arkansas, they should look to more proven policy reforms. For instance, simplifying Arkansas’s tax code while broadening the base and lowering marginal rates is a more effective strategy than trying to pick winners and losers with targeted subsidies. Moreover, the state could make significant headway by reducing the barriers to employment imposed by Arkansas’s onerous occupational licensing laws. Politicians love subsidies because they allow these politicians to say they are “doing something” about the economy. They are very visible. They get a lot of media attention. But, as this research shows, they are all style and no substance. And, worse yet, they are expensive. 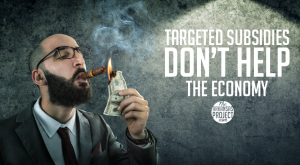 Targeted subsidies are a waste of taxpayer dollars. They do not achieve their goal — growing the economy. They are, quite simply, a transfer of dollars from your pockets to the pockets of business owners. If elected officials are really interested in growing Arkansas’s economy, they should follow ACRE’s advice and look at other policy ideas. It’s time to end the QACF and other targeted subsidies that sound nice but are really just a waste of your money.